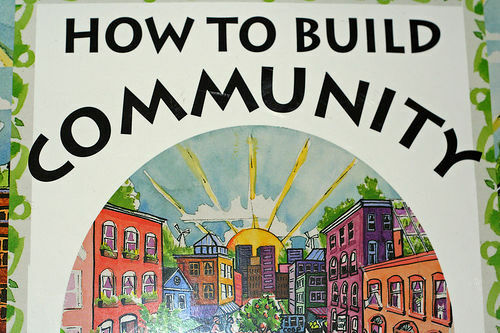 Here’s this awesome poster I saw in Sedona, Arizona that’s titled “How to Build Community.” I think it’s awesome! Wanted to share the thoughts with you. Start with friends and family. Be generous and kind to those close in your life. Tell them how much they mean to you. Enjoy the bond that you share in your experience of life together. Revel in the beauty of your companionship. We are all connected and what we do for others we do for ourselves. So many masters have preached this time and time again and now even science has shown us that there is no separation. We attract to ourselves what we give to others. So give love, give compassion, give support, give hope, give encouragement, give strength, and give truth to those important in your life and perhaps one day you’ll extend that to all your brothers and sisters of the human race. Each one of us has the power to change this world and universe in our own way. It is in the smallest of things. They’re what seem like tiny opportunities but yet have enormous effect! Strive to be more conscious and give love as often as you can. abundance, consciousness, courage, creative power, enlightenment, Evolution of Humanity, gratitude, guidance, happiness, Hope, Inspiration, joy, Life, love, Peace, Personal Growth, truth. Bookmark.